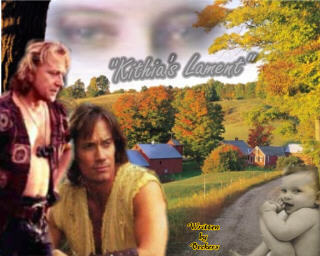 I hope you will enjoy "Kithia's Lament" which was originally written for HERCULES & IOLAUS: THE LEGENDARY JOURNEYS, a great on-line Virtual Season which finished up Year 6: The final year of HTLJ -- that which was cut to eight less than legendary episodes, for reasons none of us will truly ever understand. This story was not written as a way to infringe on the rights of any holders of HERCULES: THE LEGENDARY JOURNEYS. I am merely borrowing the charatcers for fun, relaxation and (as always) cheap therapy. It's less expensive than a psychiatrist. Unless given permission, please do not link with this website or take any of the art work (aka - to the right) from this site. If you enjioyed this fiction and wish to e-mail me, please go to "Contact Me" page.